This map and the accompanying digital database show sedimentary basins (Kirschner, 1988) and reported occurrences of petroleum in wells and natural seeps in central Alaska. The map and database were prepared for use in a U.S. Geological Survey assessment of undiscovered petroleum resources. Sedimentary basins and selected geologic features of regional importance were taken from the map of Kirschner (1988), with minor modifications in some cases. The primary source of information on seeps and older (pre-1959) wells was the report of Miller and others (1959). Additional information on seeps and wells was acquired from the published literature, public records available at the Alaska Oil and Gas Conservation Commission and the Alaska Geologic Materials Center, and unpublished documents provided by companies and individuals. Seventy six localities are depicted on the map and described in table 1 on the map. Most of the localities are within the boundary of the Central Alaska Province as defined by the 1995 National Assessment of United States Oil and Gas Resources (U.S. Geological Survey, 1995, p. 3), but the map also includes: (1) 2 localities that occur north of the Central Alaska Province boundary in the uplands near Yukon Flats; and (2) several exploratory wells that were drilled west of the Central Alaska Province boundary in the offshore Norton basin. Also shown on the map are oil and gas fields in the Cook Inlet region. Not displayed on this map, but described by Miller and others (1959) and other published sources, are numerous hydrocarbon seeps and wells in southern and northern Alaska and adjacent parts of Canada. The 76 localities depicted on this map include 3 wells with oil shows, 18 wells with gas shows, and 9 wells with no oil or gas shows. Outcrops of oil shale and (or) oil-bearing rocks have been reported at 14 localities. The 76 localities also include 29 accounts of oil seeps and 3 accounts of gas seeps. Of these, investigations by the U.S. Geological Survey confirmed the existence of 1 gas seep and concluded that reports of 16 oil seeps and 1 gas seep are doubtful or disproved. The remaining reports of 13 oil seeps and 1 gas seep are neither confirmed nor refuted and require additional study. Seeps of oil and gas are among the most useful indicators of the possible existence of nearby, buried accumulations of petroleum. However, not all reports of oil and gas seeps are reliable. In many cases, people have mistaken iron stains, mineral salts (including iron oxide scums), coal tar, and living organic material for oil seeps (Miller and others, 1959; Martin, 1923). Some of the reported seeps may be practical jokes or deliberate deceptions. Also, many oil and gas seeps are ephemeral, and a seep that was observed and reported years ago may be inactive today. 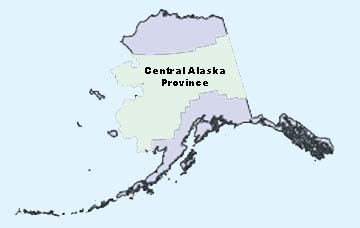 No commercial petroleum production has been obtained from central Alaska, in contrast to the prolific deposits of oil and gas that have been found and commercially developed in northern Alaska and the Cook Inlet region. Nevertheless, confirmed indications of petroleum in central Alaska include: (1)gas in seeps and wells in the Norton basin; (2) oil shale and numerous occurrences of bitumen in Precambrian to Mesozoic rocks in the Kandik area and the uplands near the Yukon Flats basin; (3) gas in Miocene coal-bearing strata in a core hole at Fort Yukon in the Yukon Flats basin; (4) gas in wells that penetrate Tertiary coal-bearing strata in the Nenana basin; (5) gas in water wells and test holes in the Fairbanks area; (6) gas in exploratory wells, seismic shot holes, and a water well in the Kotzebue basin; (7) gas in Quaternary deposits in shallow wells in the Northway lowlands; and (8) gas in an exploratory well in the Bethel basin. The scattered distribution of confirmed oil and gas occurrences implies that active and (or) formerly active petroleum systems are present in some parts of central Alaska, most notably in certain Tertiary sedimentary basins. However, much remains to be learned about the geology, organic geochemistry and petroleum resource potential of these systems.